Recently, I’ve been almost tortured with a decision that has been weighing on my heart for the last several months. I didn’t start to really recognize how much I had been debating myself in my mind until recently, and I undoubtedly have been feeling the desperate pangs of just wanting to know my answer. That was on a replay loop for the last 6 months. Truly torturous. And for the most part, I didn’t create anything awesome in that time. I started things here and there but kept stalling out because I wasn’t really asking or listening to my heart for the answer. I even made the mistake of asking others. Sometimes, others can help provide a perspective that can help give us some clarity, especially if this person knows us well and has a healthy mindset themselves. What I mean by healthy mindset is someone who sees the world in a positive light and dreams big themselves. They don’t have limiting beliefs about what is possible and they aren’t afraid of you shining your own light brightly. When I asked a few of those around me, their answers didn’t please me. They made me feel worse, actually. The reason for this is because no one knows what’s right for me except for me. No one sees the world exactly through the same lens as I do. No one has exactly the same priorities or beliefs as I do. Therefore, no one can give me my answer. No one can give you your answer. This is great because it eliminates the need for us to wander around tortured and harassing our friends and family members for answers that they can’t give us anyway. You will never be fully satisfied with an answer until it comes from your soul. This type of guidance is truly from the Divine since we’re all connected to Universal intelligence. It comes to you in the form of ideas, inspiration, and signs. How can we find the answers we’re yearning to know from ourselves, our higher selves, and the Divine? Here are a few things I do personally to find my answers. Meditation helps your mind relax and let go of all the thoughts that are going on in there. It doesn’t feel good to have a mind that is constantly plagued with thoughts and worries. Meditate daily to turn off the noise and connect with your higher self. This is my favorite guided meditation to do every night. Don’t worry if your mind wanders, what’s most important is that you’re becoming still and opening yourself up receive guidance. Maybe you’ll fall asleep (guidance can come in your dreams), or maybe your mind will keep stringing thoughts along (guidance can come in the form of thoughts; just keep listening). Just relax and allow what comes to come. You don’t have to be a writer to journal, because the purpose of journaling is to receive the answers from inside yourself. I like to start out with a question, and then remain open to what flows from my pen. You may find it helpful to meditate before journaling so that you’re in a higher vibration when you begin to journal, this way you’re more aligned with your higher self and will hear the answers more clearly. Ask the Universe to give you a sign. I wouldn’t specify what the sign should be because law of attraction will naturally cause that sign to show up regardless once you’re looking for it. Open yourself up to Divine guidance by asking for any kind of sign – usually this may come in lyrics of a song, or a bumper sticker on the car in front of you, or someone will say something to you, etc. You’ll know by how it feels. And if you’re like “omg was that a sign? !” then it was probably your sign. Quiet your heart, open your eyes and listen. I got this strategy from Lindsay over at Soul Rising. She said that when we have a tough decision we’re faced with, ask your three inner voices: logic, intuition, and fear. Do I feel guided to do this? She says your answers should be yes, yes, and hell no. It should feel logical, you should have a inner longing or passion for it, and it should feel scary because you’ll be stretching yourself, putting yourself out there and doing something you’ve never done before. When I asked myself “should I be a coach and have a business that includes launches and sales funnels and phone calls with clients…my answers were yes, no, and yes. Logically it could make a lot of sense; coaches help people and make great money doing it. It wasn’t something super scary, but more of a dreadful feeling when I thought of it. But I can’t say I felt guided to it beyond seeing others do it and thinking that I should too. This is one of my most favorite ways to receive Divine guidance (I wrote a post about my favorite decks here). Oracle cards are cards created with specific loving messages on them and they usually come in a deck of 44-52 cards. This is my absolute favorite deck. I use it to pull one card draws for quick guidance and also for bigger spreads that really go into detail about what I’m wanting guidance on. I even use this deck for my husband so it’s not strictly for women. Basically you think of questions (and I have a whole Pinterest board dedicated to different oracle/tarot question spreads) and you pull cards based on when your intuition tells you to stop shuffling and pull the card. I always hold a selenite crystal or keep it next to me when pulling cards because selenite clears negative energy, brings mental clarity, and carries a very high vibration that I believe connects you to the spiritual realm. I ground myself by lighting palo santo and dabbing anointing oil to my wrists and over my heart. I do all of this because you need to be still and present in order to feel your intuition. Those are my top 5 ways to tap into Divine guidance when you’re searching for answers. How do you tap into Divine guidance? 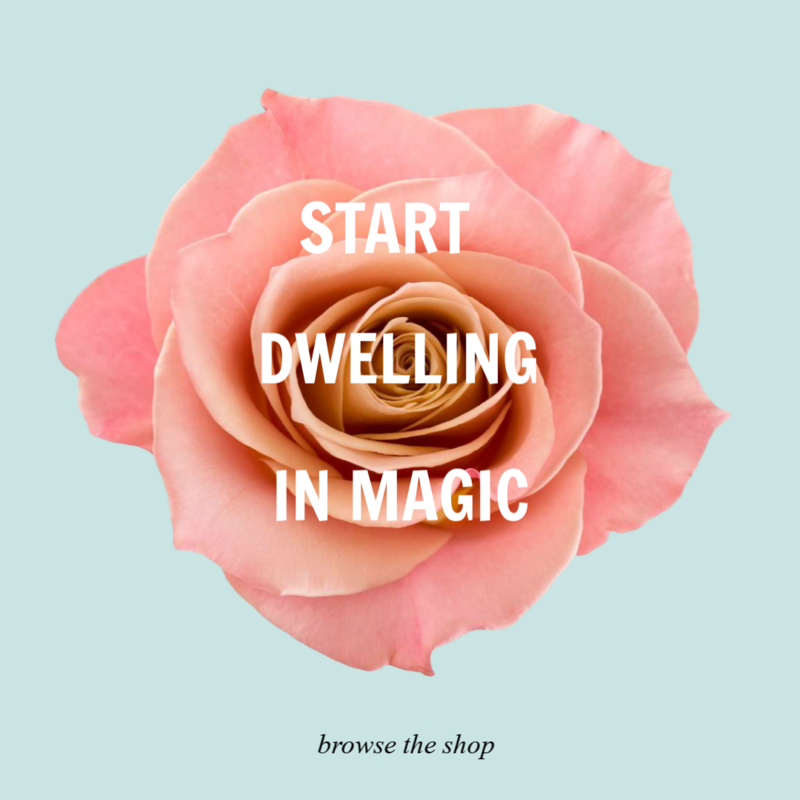 If you liked this post, be sure to connect with me on Instagram for daily inspiration on all things magical and divine. Jessica Dimas is the author of Manifesting Magic with the Moon. Connect with her on Facebook and Instagram for more inspiration and updates. These are great steps! When we were trying to decide our top three places for my husband’s residency it was so hard! We did most of these things and it really helped. In the end, we chose the places we thought we would be happiest and that our family would enjoy living the most! You really do have to follow your bliss! I hope you are able to make the decision with what you want to do! Either way, you’ll rock it! I recently have gone through just what you did. You had this big idea (coaching for you), and you know that it’s a good choice for you, but not necessarily right now. That’s exactly the revelation I got. And I came to the same conclusion you did…write. That’s all I’m doing…writing. And the desire to do just that keeps rising.